Syrian President Claims He Didn’t Use Chemical Weapons Against His Own People. Then Who Did? Now, this is getting interesting. Syrian dictator Bashar Assad claims he didn’t use chemical weapon against his own people, and adds that any reports claiming that he did are fake news. 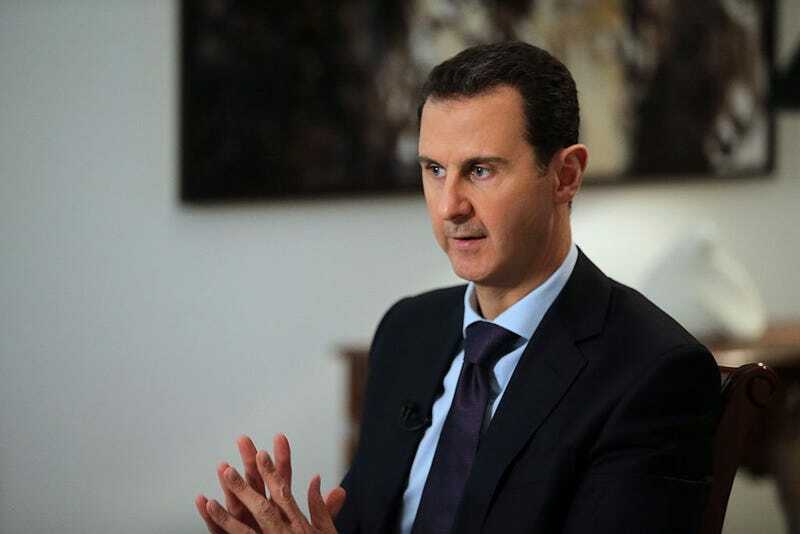 “One hundred percent fabrication,” Assad said in an interview with Agence France-Presse. Assad also claims that his nation “gave up” all of its stored chemical weapons as part of a 2013 agreement between the Russian government and Syrian military, Politico reports. The chemical attacks in Syria that left more than 80 men, women and children dead have been blamed on Assad. Horrific images showing the effects that sarin gas had on those affected was blasted across the news and social media. Rumor has it that those images are what changed coldhearted American dictator Vladimir TrumPutin’s position on Syria. The jury is still out, but let’s say, for the sake of argument, that Assad didn’t launch chemical attacks against his own people. Then who did? Read more at Agence France-Presse and Politico.